Chocolate crinkle cookies are delicious and perfectly festive for your holiday baking! 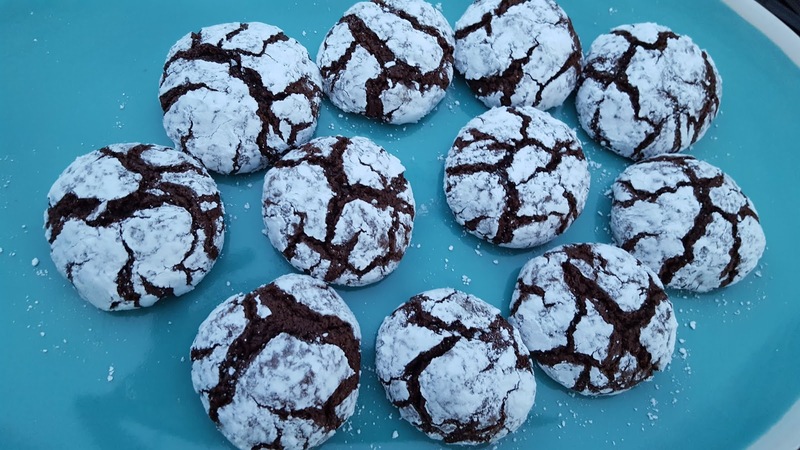 These cookies are very brownie-esque in flavor and texture. And that makes me happy! 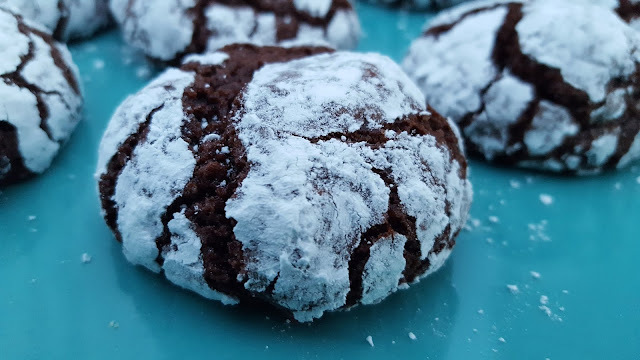 I love the way the powdered sugar coating cracks and gives texture and such a snowy appearance to these fudgy cookies. I used roughly tablespoon sized pieces of dough for my cookies and got about 2 dozen cookies, you can increase or decrease the size of your cookies as desired - just increase or decrease baking time accordingly if you want to maintain that chewy, fudgy center! Today I'm home with a sick 5-year old (we saw the flu notice on her daycare's door, and the very next day she came down with a high fever and has been very tired). So I'm watching way too much Pioneer Woman on Food Network and getting way too many (more) ideas about playing in the kitchen! I envision a few PW recipes showing up here in the not so distant future. Her chicken spaghetti was calling to me as a wonderful way to use up some of the roast turkey I have in the refrigerator today. That may be dinner tonight! In the bowl of a stand mixer, combine the cocoa powder, sugar, and vegetable oil on medium speed until well blended. Add in the eggs, 1 at a time, scraping down the sides as needed. Add in the vanilla. In a separate medium sized bowl, combine the flour, baking powder and salt. Whisk to combine. Slowly, on low speed, add the dry ingredients into the wet. The batter will be thick and sticky (very brownie like). Cover the bowl, or scrap the dough into a 3-cup tupperware container and refrigerate for at least 3 hours (the longer the better). When ready to bake, preheat oven to 350 degrees. Line a baking sheet with a silpat. Roll tablespoon sized balls out and roll very generously in the coating powdered sugar (place any additional dough back in the refrigerator between batches). Place coated dough balls on a baking sheet (12 per sheet). Bake one sheet at a time, about 10 minutes. Allow to cool about 3-5 minutes on the sheet pan then move to a wire rack to cool completely. 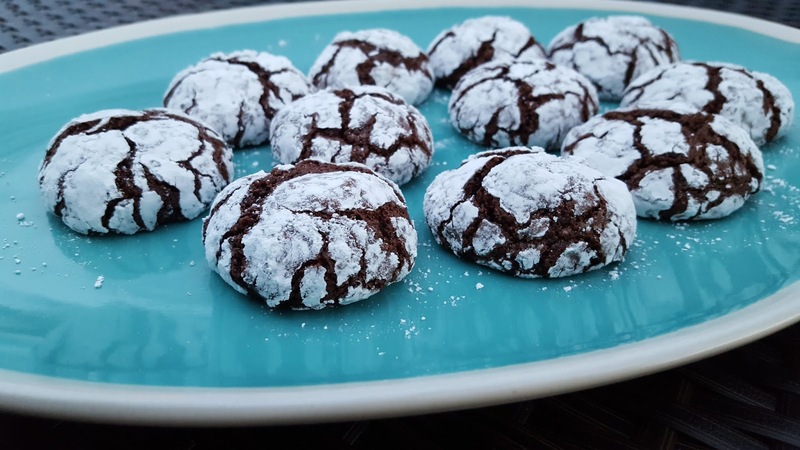 Cookies will be soft until they cool and firm up. If you over bake them they won't have the fudgy center.